The earthquakes that occur near volcanoes are usually not damaging and are typically not even felt. They can, however, occur in very large numbers. Their occurrence can indicate changes in or near the volcano. These changes may be due to the movement of magma or gas, may result from moving ice or debris, or may simply reflect the adjustment of stresses in the surrounding region. Each of these sources produces seismograms with unique signatures that can often be used to assess the cause of the earthquake. At times, the presence of certain types of earthquakes or numerous earthquakes, accompanied by other indicators, can be indicative of forthcoming eruptions. 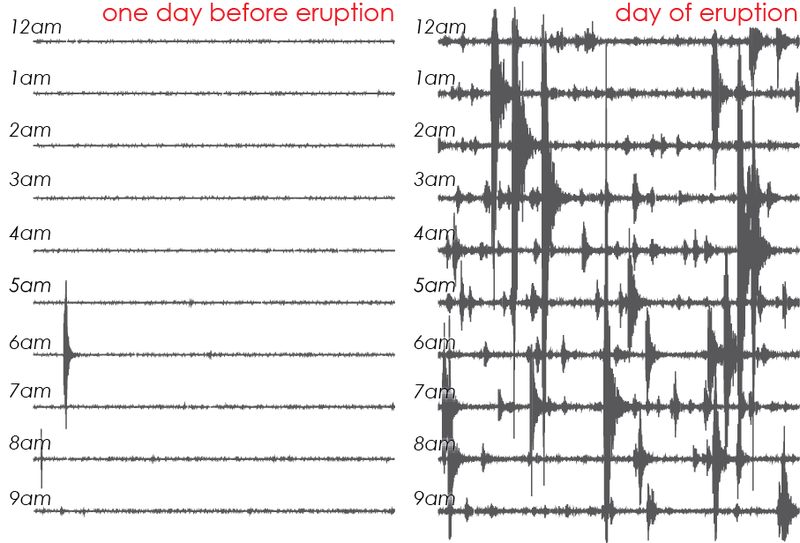 Ten-hour seismograms from a seismic station on Atka Island on August 6 & 7, 2008. The sudden appearance of numerous earthquakes was an early sign of an eruption that began later in the day on August 7. Not all swarms of earthquakes indicate eruptions; but nearly all eruptions are preceded by vigorous seismic activity. Subduction zones, where most active volcanoes are found, also generate high rates of earthquakes that are not volcanic. 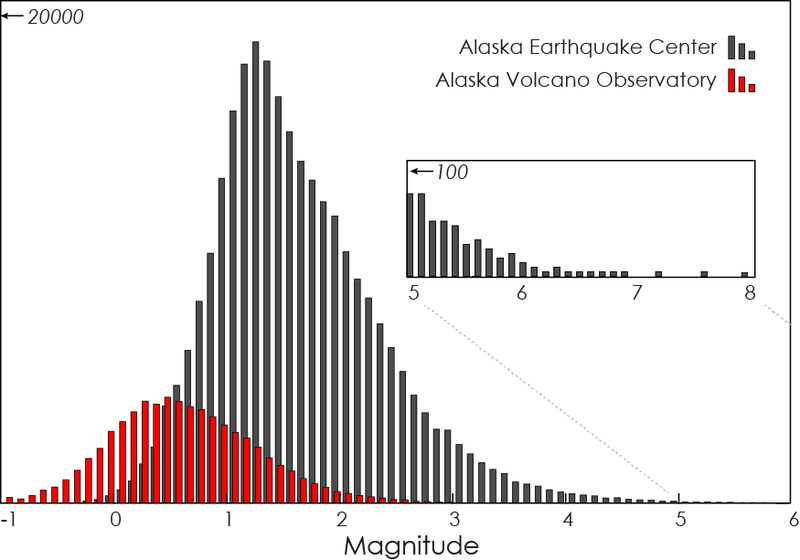 Though volcanic activity causes only a small proportion of Alaska's earthquakes, these earthquakes often warrant more detailed analysis. Identifying and characterizing earthquakes associated with volcanic processes requires its own tailored workflow. To achieve this, the Alaska Earthquake Center partners with the Alaska Volcano Observatory to track all notable seismic activity in the state. The Earthquake Center addresses large earthquakes and their societal impacts, while the Volcano Observatory focuses on the smaller earthquakes that can occur in large numbers near volcanoes. Seismic data is only one tool for monitoring volcanoes. The Volcano Observatory combines these with other observations, including geology, satellite imagery, ground deformation and local observations to assess volcano hazards. Contributions to the Alaska earthquake catalog over a decade. The bulk of the Alaska Earthquake Center catalog is above magnitude 1.5. The Alaska Volcano Observatory plays an important role in tracking the smaller earthquakes common in volcanic areas.